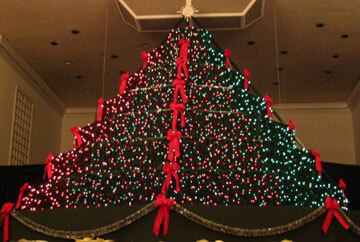 Lebanon Baptist did their first tree in 2004. Their 7 tier tree is pre-wired for a 7x7x6 matrix, but they are using twofer & threefer adapters to combine blocks and will operate as a 3x7x6 vertical matrix initially. This will allow them to easily expand in the future by adding a MR4 dimmer rack and trade-in their twofers and threefers, and will not require doing any rewiring of their tree panels. Their tree is controlled by an iMac G5, MOTU MIDI Timepiece AV interface, MOTU 828 MKII audio interface, two PC1600x MIDI controllers and the MidiLite MR3 dimmer rack.